TV News – unfiltered good, taxing bad. I like following the news on TV, along with the web, for primarily one reason – lack of a filter bubble. When I watch channel 503 on Sky, I’m hearing the same news as anyone who’s watching the channel in, at least, London and the South East. Very unlike my Google News page, which I’ve set up so articles on my interest areas to turn up on top, and to show as few articles as possible from Telegraph (too right-leaning), Guardian (too left-leaning) and FT (requires sign-in to read), and more articles from The Independent, The Economist (I have a subscription), and The NYT. My only other source of un-filtered news, other than TV News, is the daily Quartz news email. While I love the unfiltered nature of TV news for keeping me updated with happenings in areas, it can also be very wasteful. It’s here that I’d like some tweaking. For instance, my ideal BBC News (or CNN, which I also watch occasionally) bulletin should still cover all the news stories that they are covering for everyone else in the London & SE. However, just marginally personalise it for me by, say, covering Ukraine more, MH 370 less, Labour’s Europe plans more, politicians’ comments about Bob Crow less, Cycling news more, Cricket news less, and, most importantly, Silicon Roundabout more, Oscar Pistorius trial much less. The formula for my perfect new channel/app is simple: Keep giving me *all* the news. Keep giving me the same tone & message of news that everyone else is getting. However, modify the volume of coverage devoted to each news item based on my interests. Anyone out there working on this? Let’s talk! Continue reading TV News – unfiltered good, taxing bad. Posted on March 13, 2014 March 13, 2014 Categories MediaTags Filter Bubble, News, Personalisation, TV, TV NewsLeave a comment on TV News – unfiltered good, taxing bad. CNN was the flag bearer for middle-ground, relatively neutral news gathering in the US, and increased polarisation in US politics after Obama’s election seems to have hurt it the most. 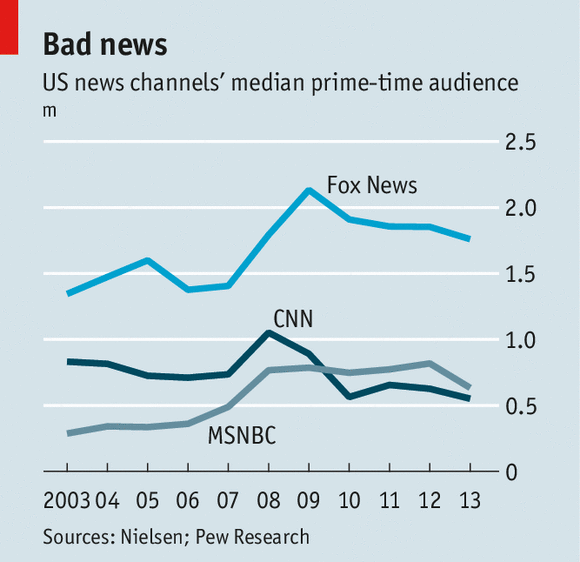 The chart seems to indicate that CNN lost viewers to Fox News in 2008-09. This seems to line up well with the post-Obama election backlash from conservative right, and rise of the Palinistas-Ryanistas / Tea Party movement championed by Limbaugh and supported+tapped by Ailes. 2009-10 saw CNN losing market-share again, while MSNBC held steady – must have been about the time when MSNBC started tilting its programming towards the Democratic left1. Net result: In 2 years, CNN lost half its prime-time news audience, as viewers on the right and left moved to news networks that echoed their own political views. While researchers worried about effects of filter bubbles on the internet, the offline news consumption in living rooms was being filtered just as fast. Read the full article on CNN’s recent transformation here.